June around the region is primo wildflower time. June in Mono County? Say hello to all sorts of wondrous wildflowers. 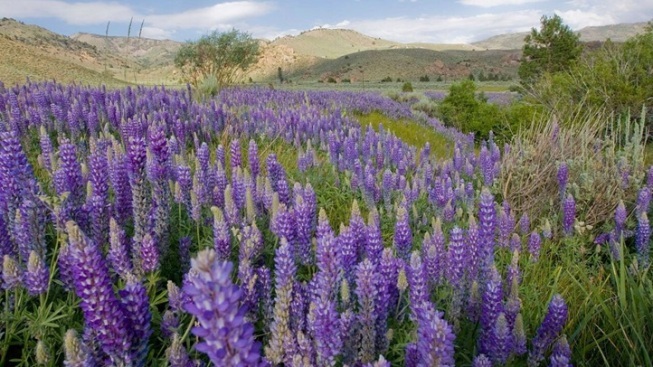 MONO COUNTY, the lovely land o' lupine, paintbrush, hawksbeard, mule ears, and sticky yellow-throats. Those poetic petals have a way of making their seasonal bows around June, or a bit earlier, and finding the flowers means finding a hike that will take you to where they're known to appear. Mono County Tourism is there for us, dear wildflowerians of California, and this very page can direct you to various trails, roads, and lakes where these mountain gems show their seasonal stuff. And if you can't quite find that spread of lupine or Labrador tea shrub you're seeking, take heart: June is a time of lake fun, of fishing, picnics, and soft, late-spring mornings and evenings. Seek the flowers but revel in whatever Mono marvels you are lucky enough to encounter.